Subject: A noble lady during the Renaissance (Italy). Estimated value (2014): Up to $1 billion *Based on the sales of comparable artworks and adjusted for inflation & value appreciation. Google Trends: Ranks higher than Starry Night, The Scream and da Vinci's own The Last Supper. History: The Mona Lisa was stolen from The Lourve in 1911, but was retrieved and returned to the museum in 1913. The painting has been a popular target of parody art. 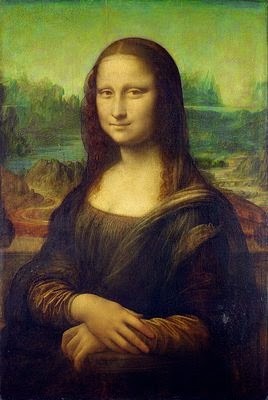 For almost 600 years, Lady Mona Lisa and her enigmatic smile have fascinated art enthusiasts and non-enthusiasts alike. Until this day, we are still uncertain as to the true identity of the smiling lady featured in the masterpiece. Debates still rage on whether this person is actually a woman. Although this work was expertly crafted, it was only one of many Renaissance masterpieces. What has allowed the painting to capture people's attention for centuries, however, is its subtlety and mysterious aura. Many people have devoted their entire lives trying to decode the painting's (allegedly) secret messages. Fictional works like Dan Brown's The Da Vinci Code were able to ride on people's curiosity to the top of the New York Times bestseller lists. All in all, one could argue that the popularity of the Mona Lisa is partly due to Leonardo's impeccable reputation as an inventor and scientist. Leonardo da Vinci applied his scientific knowledge to the max on this masterpiece. The lady in the picture is symmetrical, perfectly proportional and life-like. Da Vinci was one of few Renaissance painters who mastered an oil technique known as sfumato -- an important invention at the time. This shading technique bypasses the need for lines and borders, allowing a more natural image. While the lady's enigmatic smile gets all the attention, the landscape in the background is also a major mystery.